Proper treatment can help alleviate symptoms of severe arthritis. Osteoarthritis is a debilitating condition which involves the degeneration of cartilage. Osteoarthritis is the most common type of arthritis and it can be caused by a number of reasons including herditary factors and obesity. Due to the joint damaging involved with Osteoarthritis it can result in great amounts of pain. A fair amount of this pain is caused by one symptom of the osteoarthritis which is swelling. The pain caused by this swelling can cause the already debilitating nature of Osteoarthritis to become even worse potentially leading to more missed activities and oppurtunitiesFortunately all is not lost as King Brand Healthcare Products® has devised treatments for the pain caused by swelling. These treatments are the Blood Flow Stimulation Therapy (BFST®) and the ColdCure® wraps for treatment of pain and swelling. King Brand Healthcare Products® are the innovators of Blood Flow Stimulation Therapy (BFST®). Blood flow is one of the most critical elements for the rapid treatment of severe Osteoarthritis pain. Blood flow is critical because it relaxes the swollen muscles around the damaged joint which relieves the pain caused by Osteoarthritis. Physical activity will also promote blood flow but excessive activity could possibly lead to further degeneration of the joints. With a King Brand® BFST® therapy device for Osteoarthritis, blood flow can be stimulated in the afflicted joint while the patient is at rest. With improved blood flow and without the risk of greater damage that comes with with physical activity, patients can be relieved of severe pain faster. The BFST® (Blood Flow Stimulation Therapy) Wrap is designed to promote blood flow in the affected joint below the dermal (fat and skin) layer. Utilizing our proprietary Energy Web®, specially controlled EMR energy envelops your joint and stimulates blood flow deep beneath the skin. The resulting blood flow helps to relax muscles which reduces pain caused by arthritis. As an FDA Registered Medical Device the BFST® wrap is suitable for use in hospital and therapeutic clinics. Because the device is completely safe for patients to use themselves, the BFST® wraps can also be used by the patients at home. Home use allows for pain relief whenever you may need it. The Energy Web® of the BFST® therapy device is enclosed in a soft, comfortable neoprene wrap. The wrap shapes the energy web® to mold around the complex forms of your various joints to ensure that there is an even distribution of energy over the swollen muscles surrounding the damaged joint. The wrap is opened and closed using attached velcro straps that guarantee a perfect fit. As well, the wrap and unwrap design allows for easy wrapping and after treatment the wrap does not need to be removed so it can continue to provide comfort. 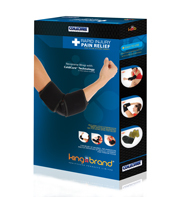 After treatment the straps can also be further tightened to provide snug support and protection for the damagedjoint. The device disconnects at the wrap from the power supply and controller so that the user is free to move about the treatment clinic or home when not receiving treatment while still wearing the wrap for support and comfort. The device is incredibly comfortable to wear. 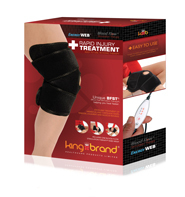 King Brand has developed the ColdCure® line of compression wraps specifically designed for the treatment of pain and swelling of individual afflictions, including Osteoarthritis. These wraps contain several advancements in cryotherapy technology that provide the longest lasting cold therapy possible. The temperature is closely regulated so that the body tissue gets neither too cold to be damaged nor gets warm too quickly to be ineffective. The rigid gel stays in place and allows for persistent cold compression immediately over the damaged joint. ColdCure® wraps are easy to use, safe, targeted and extremely effective. ColdCure® technology provides superior control of the swelling and pain without the negatives of drugs. The patient gets the relief they demand and they are still able to reduce pain as quickly as possible. Pain and swelling. Without pain and swelling, patients may not know just how serious their Osteoarthritis may be. Pain and Swelling are the symptoms that drive patients to seek urgent medical help. As professional healthcare providers, we care about properly treating the Osteoarthritis but recognize that the pain isn't the true problem, its only a sign of the problem. All too often patients judge professional medical services based solely on their ability to address the pain and the swelling caused by arthritis because that's the only part that they can see and feel. As medical professionals we first want to address the underlying disease, but we also want our clients to live without pain through the healing process. Pain killers are an easy solution, but we all know they are not the best one. Pain killers (NSAIDs/analgesics) such as acetaminophen, ibuprofen, and ASA are known anticoagulents - they can prevent the blood from clotting. This group of medicines interfere with normal blood function that is crucial for the optimal treatment. We know this isn't the best solution for treating the pain. Narcotics and steroids are not desirable options either, especially for our regular patients who are not under professional medical supervision 100% of the day. Even injured professional athletes who are under regular medical supervision are kept away from drugs if possible. The best possible solution for pain and swelling control caused by Osteoarthritis is clearly using ColdCure® technology. Cold compression wraps are standard medical products for the treatment of pain and inflammation, two common symptoms of arthritis. Cold and compression applied to an inflammed joint immediately reduces the risk of further damage cause by excessive swelling. This swelling is usually in the muscles surrounding the joint and Doctors and Therapists both agree that controlling swelling is a fundamental part of reducing long term pain and possible damage as a result of arthritis. The King Brand® ColdCure® Wrap is a medical grade cold compression wrap designed for use in hospitals and injury therapy clinics as well as in the home. The ColdCure® wrap exceeds all government and health agency regulatory requirements for cold therapy use in cases of Osteoarthritic pain. The oversized cold packs in all ColdCure® wraps contain specially formulated gel with more cooling power per lb than standard wraps. This allows for longer treatment durations without having to recharge the wrap or switch cold packs. The longer treatment times and more cold power means more pain relief, better control of swelling, and less handling of the damaged joint. These all result in a better treatment of Osteoarthritis. Each ColdCure® wrap comes with 3 large cold packs allowing for immediate re-use in clinical settings or the ability for extended treatment durations which allows for further reduction of swelling and pain. Like the BFST® Wraps, ColdCure® wraps are enclosed in soft, comfortable neoprene wraps. The gel pack is specifically designed for the shape of the joint. We do not use one common gel pack in all our wraps - each joint is shaped very differently than any other joint or body part and each one requires a custom designed pack if it's going to work the best. No other wrap in the world has specifically designed cold packs for each and every part of the body The wrap molds the cold pack around the entire joint to ensure that there is an even distribution of cooling power over the entire affected area. It will quickly become clear that this product has in every way been designed to be 100% an Osteoarthritis treatment device. The wraps use RigiGel® technology so that the gel does not flow away from the afflicted joint when placed under pressure but is still soft and easily molds to the body. ColdCure® wraps are unique and of a higher quality and performance than any other wrap available. Nothing else comes even close. Again, like the BFST® wrap, the ColdCure® wrap is opened and closed using attached velcro straps that guarantee a perfect fit. The wrap and unwrap design allows for easily applying it around a tender, injured, joint without having to slip into or out of a tube shaped device. Note from KB WebMaster - The text below is primarily intended to assist with Google properly classifying this page content. To learn more about our products please visit our website.<br>Osteoarthritis is damaging of a joint. Osteoarthritis is a disease with many causes. Osteoarthritis is an incredibly common disease and condition that afflicts millions of people. The pain of Osteoarthritis is real. Osteoarthritis results in a lot of pain and stops you from being active. To speed up treatment, you need to treat your Osteoarthritis with BFST treatments. BFST treatments help your Osteoarthritis pain reduce quickly. Coldcure treatments help relieve pain. Relieve Osteoarthritis pain by using a coldcure wrap many times each day. Symptoms of Osteoarthritis are lessened by coldcure treatments. Osteoarthritis is painful. Osteoarthritis can be treated. You can treat Osteoarthritis quickly with the proper treatment. The afflicted joint needs to be treated quickly for pain to be relieved. BFST and Coldcure treatments are natural treatments that help you relieve yourself of pain. If you have Osteoarthritis we have a treatment.